I’ve recently published several series detailing some of the patterns we’ve seen around large-scale IT transformation and cloud migrations. In 2014, I talked about “analysis paralysis” being one of the biggest impediments we’ve seen get in the way of large organizations take advantage of cloud. Today, AWS’ Ryan Hughes details some of the shortcuts he and his team have identified as they’ve helped dozens of large organizations migrate to the cloud and avoid analysis paralysis…. Recently, the AWS ProServe Advisory team has been helping some of our largest enterprise customers analyze and prioritize their application portfolio to help them prepare to migrate to AWS. Interestingly, we have found that this analysis (also referred to as portfolio rationalization or application disposition) has started to eat up a disproportionate of time, as compared to the other phases of an overall migration effort. Why? Many enterprises tell us that once they dig into their existing IT portfolio information, harvested from places like their configuration management database (CMDB) or asset management system, it turns out that the information is unexpectedly inaccurate or outdated. This uncertainty can lead to delays in the migration process, and we find that many executives will press pause until they can get a more accurate picture of the business value their applications serve, resources they consume, and the licenses they utilize. While we agree that an analysis to gain an understanding of the applications’ underlying components (e.g. development languages, virtual machine sizing, operating systems) is a vital step to ensuring applications migrate to the cloud in an efficient manner, many enterprises make the mistake of having all of this information as a prerequisite to doing anything with the cloud (analysis paralysis), rather than looking at portfolio analysis as an on-going and iterative part of their migration. 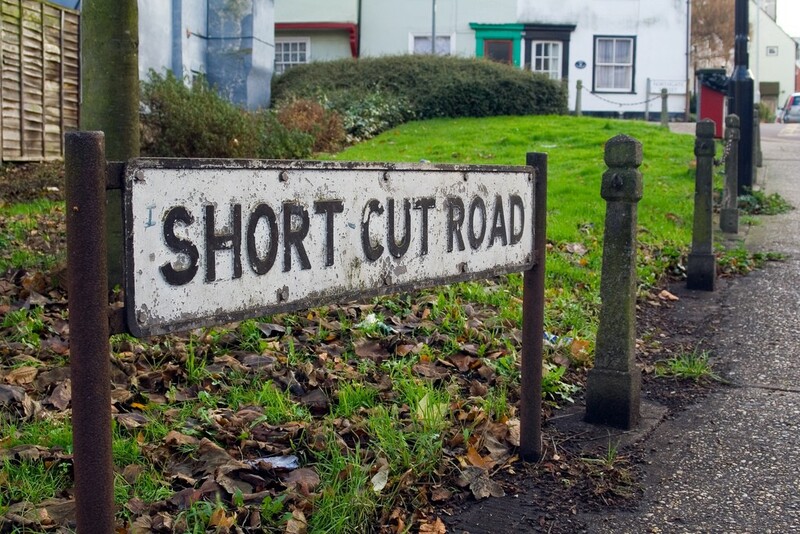 Working alongside their process engineers and cloud team, we derived three primary accelerators that we now call “shortcuts”. Cardinal Health shared their outcomes at AWS re:Invent in December 2016 (video), and we’ve used these shortcuts with several other customers. Analysis-paralysis? Many enterprises make the mistake of treating a full portfolio analysis as a prerequisite to starting their cloud migration. 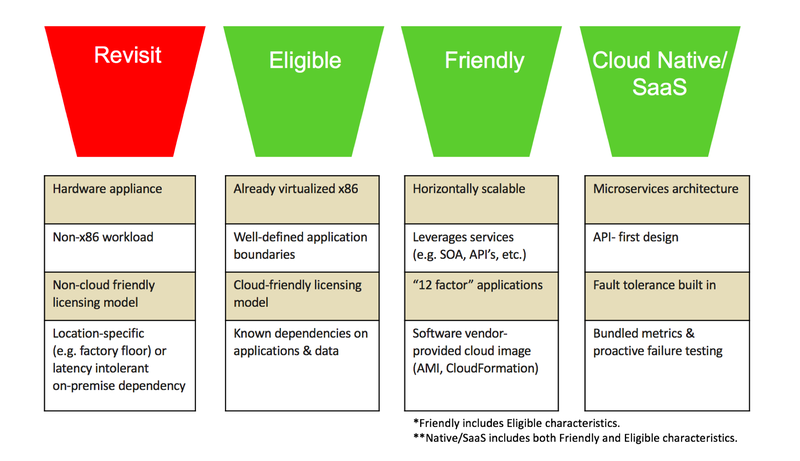 Instead, we recommend enterprises strive quickly to understand which applications are Cloud Eligible, Cloud Friendly, or Cloud Native (criteria below) and then execute a dive deep analysis on just that subset of applications. After applications have been “bucketed” based on their charactistics, these applications should be prioritized into a backlog (see previous post on Cloud Migration Process) for migration teams to start the migration process to AWS immediately. This just-in-time approach to feeding the backlog enables the migration teams to leverage their on-going migration experiences to provide validated insights back to the portfolio analysis team for more precise application selection during future iterations. Many large enterprises, led by the examples of Capital One, General Electric (GE), and Dow Jones are migrating large portions — and in some cases all — of their IT portfolio to the cloud… And, it’s no mystery why. It is well documented that enterprises can reduce costs by moving workloads from on-premise to AWS. While saving money never goes out of style, our most successful customers do not solely focus on mass migration of existing applications. In fact, the most popular pattern in which enterprise customers adopt AWS services, known as the “Stages of Adoption”, is to begin with small innovation-focused projects. These innovative projects work to expand the mind-sets and skill-sets of the enterprise IT staff beyond the bounds of their usual data center constraints. Infrastructure-as-Code, fully-managed cloud services, and serverless architectures instantly come within reach and serve as “art-of-the-possible” examples that springboard an organization’s cloud knowledge. Innovation projects are much more than science experiments that up-skill staff members. They also enable a different type of financial incentive to the business. Instead of the IT organization only being responsible for driving costs down through a mass migration of existing workloads, IT can start directly contributing to growth of top line revenue. As a bonus, the surge of cloud knowledge that innovation projects provide actually acts as a catalyst to accelerate the velocity of the organization’s mass migration initiative. The combination of executing both approaches (mass migration and innovation) at the same time has been the key strategy for top enterprises being able to drive up their top line revenue, while also bringing down overall IT cost. When analyzing their portfolio, many organizations place large enterprise applications like SAP, Teradata, and Tableau solutions into the “Revisit” bucket due to the complexities associated with these proprietary systems. However, several other customers have seen great opportunity to quickly turn these solutions into one of the “green” cloud buckets above by leveraging preconfigured, cloud-ready solutions directly from their current software vendor or a similar competitive vendor. Instead of leveraging a Rehost or Refactor migration strategy (see previous post on the 6 R’s of Migration Strategies), top enterprises have found the fastest way to get some of their complex environments into the cloud is with a Repurchase strategy. Now, just because it’s called “Repurchase” doesn’t mean you should dump your current solution vendor. Many AWS partners have already moved toward the direction of making their solutions available on cloud. A common example of this is replacing on-premise SAP development and test environments with deployments from AWS Marketplace. AWS has worked with SAP to ensure their available solutions are tested and preconfigured to run in an AWS environment. This turns an enterprise’s cloud initiative for these types of solutions into more of a data migration and configuration exercise than a full scope migration. The same can be said for Teradata, Tableau, and over 3,000 other software solutions from over 1,100 vendors… and customers are finding that by using these preconfigured deployments a lot of the work of migrating these applications is done for them. The power of this shortcut has resulted in many enterprises starting to look at the Repurchase migration strategy as the “preferred” strategy for cloud migration during their portfolio anaylsis process. In summary, by using these three shortcuts, enterprises have been able to reduce their time-to-value when making decisions about what applications or business functions to move to the cloud first. In addition, enterprises can accelerate their cloud initiatives further by visiting AWS Migration Partner Solutions page to browse validated tools, services, and partners that have achieved our “Migration Competency” in different categories of the portfolio analysis process, including discovery, planning, and application profiling.